Gives students an authoritative look at mental health counseling in action: Voices from the Field features provide real-world context, and leading professionals speak on their areas of specialization. Includes full chapters covering topics critical to a developing a sound understanding of the profession and the standards of excellence that lead the practice. The Enhanced Pearson eText provides a rich, interactive learning environment designed to improve student mastery of content with embedded video and internet resources. The Enhanced Pearson eText is also available with a loose-leaf version or without a print version. Included is coverage of the development of clinical mental health counseling as a profession, ethical and legal issues in clinical mental health counseling, education and credentialing, employment settings, advocacy; assessment and diagnosis, case conceptualization and treatment planning, managed care, consultation, prevention and crisis intervention psychopharmacology, forensic mental health, addictions, clinical supervision, Internet based counseling. Voices from the Field features in each chapter show students the real world practice of clinical mental health counseling. A chapter on crisis intervention and prevention (Ch. 10) introduces readers to the life and death decisions involved in daily practice. A chapter on psychopharmacology (Ch. 11) helps readers learn to integrate their practice with the medical community by providing a foundational knowledge of psychopharmacology—while helping faculty meet on the CACREP standards for CMHC. A chapter on forensic mental health counseling (Ch. 12) provides an overview of the types of activities related to forensic mental health that counselors may experience, and provides an understanding of an area that may lead to additional employment opportunities. A chapter on technology and counseling practice (Ch. 15) looks at the growing phenomenon of distance counseling, providing students with a foundational base in technology related to counseling and the basic principles of distance counseling. The chapter also provides guidance on credentialing in internet-based counseling. A chapter on clinical supervision (Ch. 14) helps prepare students for the process involved in their field experience and eventual clinical practice, and guides them for advancement in their professional development. 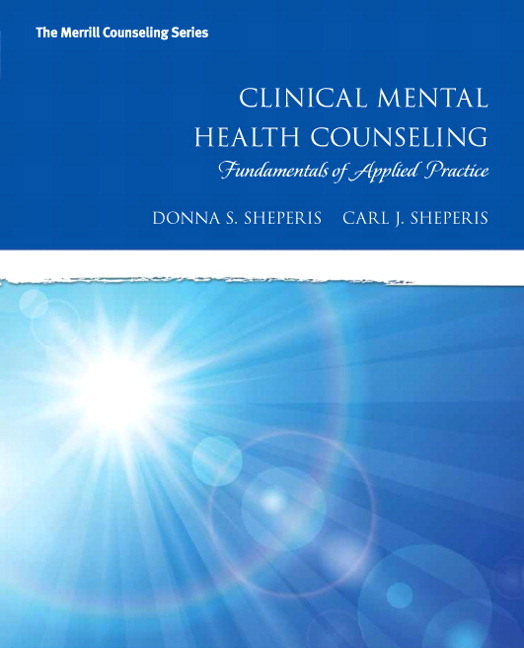 Chapter 1: What is Clinical Mental Health Counseling? Dr. Donna S. Sheperis earned her Ph.D. in Counselor Education from the University of Mississippi. A Core Faculty member in the Mental Health Counseling Program of Walden University, Dr. Sheperis is a Licensed Professional Counselor, National Certified Counselor, and Approved Clinical Supervisor with 20 years of experience in mental health settings. Active in professional organizations at the state and national levels, she served as president of a state chapter of the American Mental Health Counseling Association (AMHCA) and as co-chair of the American Counseling Association (ACA) Ethics Committee. As a Licensed Professional Counselor and Certified Clinical Mental Health Counselor, her professional experiences include working with children and adolescents in residential group home settings, serving as the adult outpatient services coordinator in a community mental health setting, operating a behavioral assessment private practice, and supervising students in a university counseling center. Her primary areas of interest include mental health and coping; counselor development; ethics; and supervision. Dr. Carl Sheperis serves as Chair of the Department of Counseling and Special Populations at Lamar University. He is Past- President of the Association for Assessment in Counseling and Education, Associate Editor for the Journal of Counseling and Development, and a Director for the National Board for Certified Counselors. He has worked with the American Counseling Association as the chair of the Research & Knowledge Committee and has served as the Editor of the Journal of Counseling Research and Practice. In addition to service, Dr. Sheperis is an author of several other textbooks including: Research in Counseling, Quantitative, Qualitative, and Mixed Methods; Assessment Procedures for Counselors and Helping Professionals; The Handbook of Online Counselor Education; and The Peace Train. He is also published in various other textbooks, academic journals, and reference volumes, Carl Sheperis has contributed articles and entries to the Journal of Counseling & Development; The Family Journal; The Journal of Mental Health Counseling; The Clinical Supervisor; The Journal of Professional Counseling, Practice, Theory, and Research; The Professional School Counselor’s Handbook; Assessment for Counselors; the ACA Encyclopedia; and elsewhere. A frequent speaker and presenter at professional conferences and workshops, as well, Carl Sheperis has appeared at such recent events as the American Counseling Association World Conference, the Association for Counselor Education and Supervision Conference, the National Assessment Conference, and the National Head Start Conference.